Direct walkin on 18th July ! #Note :- As i knw Recently many people tried..so please share your experience ! # FRESHERS WITH GOOD KNOWLEDGE IN THESE TECHNOLOGIES WILL ALSO BE CONSIDERED. # FRESHERS WITH GOOD KNOWLEDGE IN THE ABOVE TECHNOLOGIES WILL ALSO BE CONSIDERED. 9. Ocwen Financial hiring Finance Graduates! # We Need an SEO Analyst with must have knowledge about Search Keywords and also Familiar with Search Engine Marketing tools. And must have knowledge in handling Facebook, YouTube, Twitter and Manage the Social Media Campaigns. 13. Trigent Software Ltd hiring min 5 month + Linux admin ! 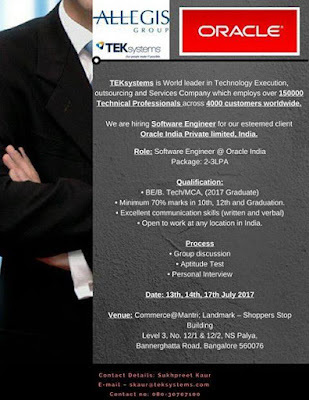 This is regarding the job opportunity with our client in Bangalore Location. Please find below job description for the same. Good vocal and written communication skills. 14. Convergys is hiring for the role of '#Technical_Support_Associate(Voice)'.